The Stovax Riva Studio 1 Inbuilt features ultra contemporary styling that fits in perfectly with all modern interiors. 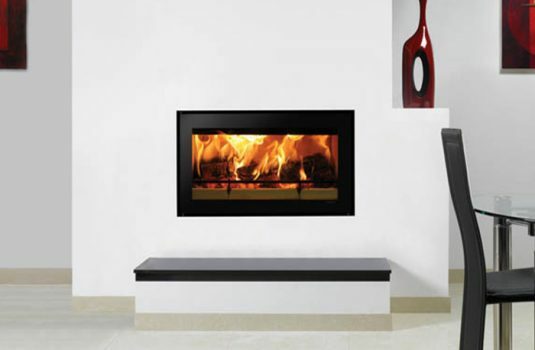 This fire is available in 3 sizes and with a stunning range of frame options. to burn the excess hydrocarbons in the smoke. Airwash air flow also helps keep the window clean, allowing you to enjoy the flames to the full. The Riva Studio offers you full control of flame aesthetics. From a lazy roll to a lively roar, you can adjust your fire to suit your mood. The doors on the Studio 1 and 2 are left hinged whilst the larger Studio 3 door opens downwards, minimising the risk of ash falling beyond the hearth and into the room. Price for Unit only, fascias and flue kit additional.